‘Map The States’ is a helpful geography resource that requires kids to remember the states of the U.S with ease. They need to locate 15 U.S states from the word-search puzzle and circle them with a pencil. Besides remembering the states with kids, the free geography worksheet is a great practice session of spellings too. 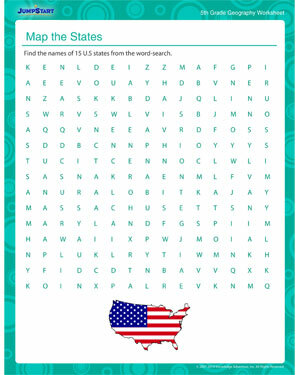 Difficult spellings like Mississippi, Connecticut, Massachusetts, Missouri, and more will be revised with the help of this great geography printable. Browse more geography PDFs for great practice sessions.